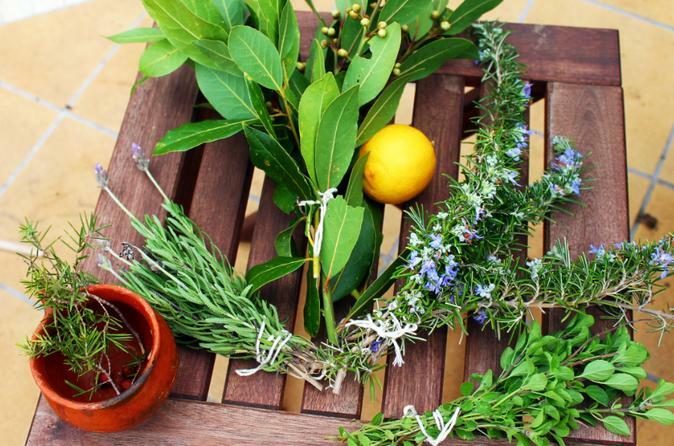 Get a taste for ‘Hierbas,’ a traditional Mallorcan spirit made with local herbs, during this 4.5-hour liquor-making class at a local home. Journey to your guide’s home village, walking the nearby hills to collect fresh herbs. Then prepare your fresh-made liquor on the host’s patio accompanied by a ‘merienda’ (light snack). Your homemade bottle of ‘Hierbas’ is yours to keep. Meet up with your guide in the afternoon in Central Palma. Then grab a bus that will transport you to the guide’s home village of Esporles, located amidst Mallorca’s UNESCO World Heritage-listed Serra Tramuntana Mountains. Arrive in the village and set off into the hills to search for fresh herbs to use in your ‘Hierbas’ mixture. Soak up the amazing landscape as your guide shares details about the local plant life. Your group will supplement its haul of plants by visiting the gardens of a nearby villagers to collect orange and lemon tree leaves (and make some new friends). After gathering the necessary ‘Hierbas’ ingredients, head to your host’s patio, to begin preparing your bottle. Choose a personalized blend of herbs and leaves to suit your personal tastes, indulging in a ‘merienda’ (light snack) as you work. The sight of the sunset in the distance will add to the atmosphere of your ‘Hierbas’ experience. Leave your class with a freshly-made bottle of this authentically Mallorcan spirit. Although it will take 3 months to ferment, you’ll soon have a one-of-a-kind souvenir to share with friends and family back home. Travelers who only use carry-on luggage need not worry: smaller carry-on friendly bottles are also available. Finish your trip back in Palma.